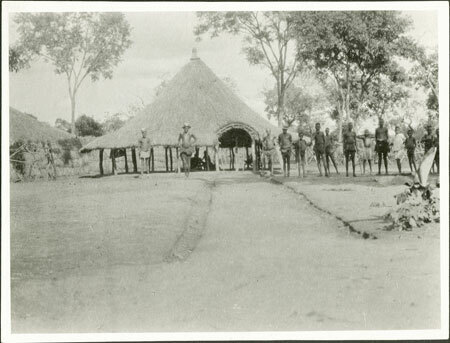 The open sided shelter (baruti) seen in the background of many portraits taken by Evans-Pritchard, possibly constructed for Evans-Pritchard's use, but since there is a fence between this shelter and Evans-Pritchard's sleeping hut out of frame to the left, it may be a meeting shelter belonging to the chief. A number of informants or neighbours are looking on. Notes on print/mount - there is a partially obscured pencil note on the reverse of the print that almost certainly reads "83/B"
Morton, Chris. "Evans-Pritchard's compound in Zandeland" Southern Sudan Project (in development). 03 Jan. 2006. Pitt Rivers Museum. <http://southernsudan.prm.ox.ac.uk/details/1998.341.455.2/>.